Welcome to Christiana Creek Dental Care, P.C. At Christiana Creek Dental Care, our priority is to deliver quality care to informed patients in a comfortable and convenient setting. Christiana Creek Dental Care, P.C. believes that informed patients are better prepared to make decisions regarding their health and well being. That is why we've included an extensive section on this web site covering the full array of topics associated with dentistry and dental diagnoses and treatments. We encourage you to look through these pages whenever you have an interest or concern about your dental needs and care. If you would like to see what our patients have to say about our office, take some time to read our Patient Testimonials. The best care in the world doesn't mean anything if you can't access it. 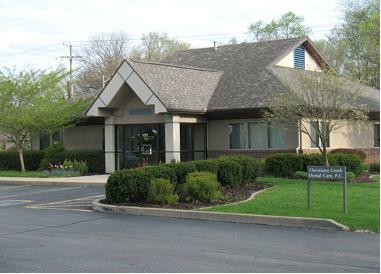 At Christiana Creek Dental Care, P.C., we strive to make our Elkhart office as efficient and convenient as possible. Included in these web pages is information about Christiana Creek Dental Care, P.C. 's office, including our Elkhart location, maps, directions, hours, insurance policies and appointment scheduling. You can even email us a request for an appointment right here! Dentistry is an art as well as a science; dental crowns offer a perfect example of this. A dental crown or “cap” is a covering that fits over a damaged, decayed or unattractive tooth. Dr. Schill is a graduate of Indiana School of Dentistry and the University of Notre Dame. He maintains active status in the American Dental Association and the Indiana Dental Association. "A positive and professional experience facilitated by a caring and engaged staff. Well done! I have and will continue to recommend Christiana Creek Dental to friends, neighbors, and colleagues." "Everyone in the office is pleasant. The office is comfortable. I never feel pressured into having dental work done. I am very happy with CC Dental." "I can't think of a thing that I would change. Everyone is so kind and friendly. The atmosphere is wonderful."